Epic Games has provided another full week of challenges for players to complete in Fortnite Battle Royale. What makes Week 6 a little different is that the development team has launched battle pass tasks that haven’t been used before. This includes the new Time Trials being set by Epic Games around the Fortnite island map. Having leaked earlier in the week, fans have now found out more on the new challenges facing them in week 6. As part of the big Season 5 update, Epic Games has made three of the weekly challenges available for free and the other four challenges exclusive to Battle Pass users. The challenges are separated into hard and regular tiers of difficulty. So when it comes to completing this week’s big Fortnite challenges, what do fans have to do? As the name suggests, battle pass owners will have to complete a set of courses dotted around the Battle Royale map that acts as obstacle runs. 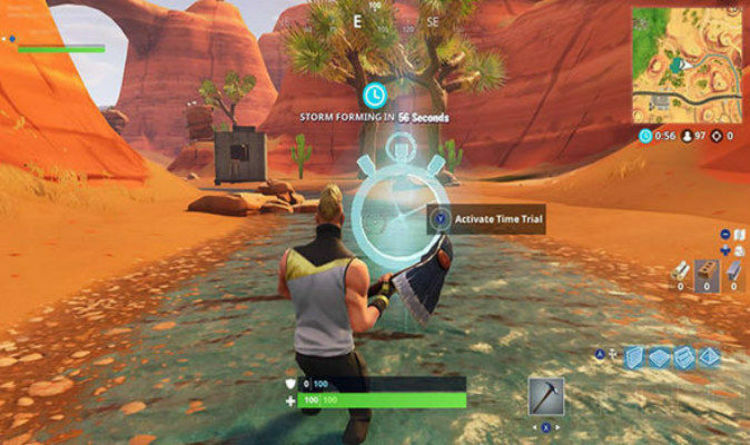 Fortnite players have to walk up to one of the blue, translucent stopwatch icons and then activate it. Then, they have to run through all the other Fortnite stopwatch icons before the timer runs out. Our advice is to look at the layout of all of these stopwatches and try and chart a course you can run in one fell swoop. You don’t want to be doubling back midway through an attempt at one of the Fortnite timed trials. In total, you need to finish five of these courses to complete the challenge. Completing the Fortnite “search where the Stone Heads are looking” will reward players with 10 Battle Stars – the amount needed to level up an entire tier. And lucky for fans in a rush to grab that new tier, we now know where to search to find the new star. The Fortnite Battle Star can be found on top of a grassy mountain that’s on the edge of Salty Springs. Express.co.uk – now that the challenges have gone live – have checked and we can confirm that the Battle Star is in this location. Just head to that grassy mountain (found on square F7) and at the highest point of it facing north the Battle Star will appear.